The below is a development history of the InsectBot, which Luke Cole has primarily developed on a part-time basis. Performed research experiments, see the research page for more information. Demo'ed research experiments at ANU Open Day 2008 and ACRA 2008. Wrote an API for programmers wishing to use the robot. 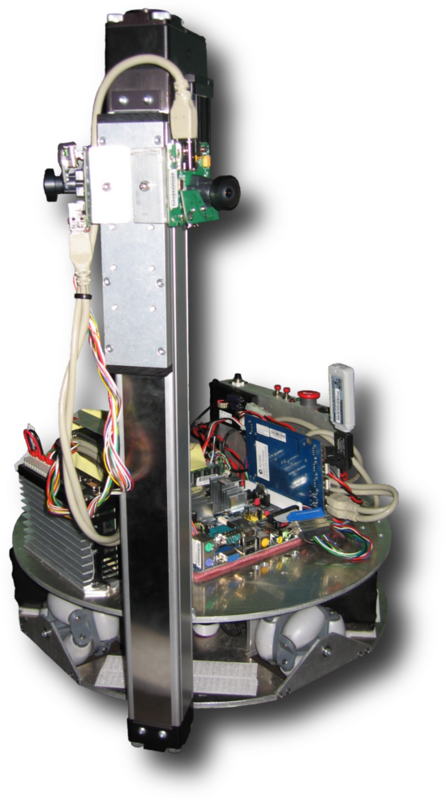 The API allows one to simply control the robot motors, lift-platform and receive images over the network (wired/wireless). Wrote some test software to acquire video seqences, odometry information with ground truths. The past months have been very enjoying as the InsectBot is now driving around under closed-loop control. The lift platform software is complete and is currently being mounted. Model the open-loop response of the new motors/gearboxes. Then design a closed-loop controller. Finish the lift plaftorm serial driver. Touch-ups: example mounting cameras and finishing overall high-level code for users of the InsectBot. Unfortunately, another few more slow months, mostly due to Luke Cole not being able to provide much time on the project and also spent some time continuing some researching on a novel Hough Transform algorithm. Smart Cars USB2.0 PWM/encoder needed some repairs (due to apply the providing the wrong power source, and the circuit has no over load protection). Lift platform motor amplifier was found to be incorrect and required replacement. New motors, gear boxes and mechanical design arrived. Assembled new mechanical design and mounted/wired motors, motor controllers, Mini-ITX computer, batteries, 24V-to-12V DC-DC converter, lift platform controller. Built Smart Cars USB2.0 PWM/encoder board and tested. Currently working on closed-loop controller for the drive mechanism and lift platform serial driver software. NOTE: The SICK Laser scanner in photo is only there to show the robot can now support such a powerful senor. No real progress, as Luke Cole was researching a novel Hough Transform algorithm and other team members were busy with their research and conferences. 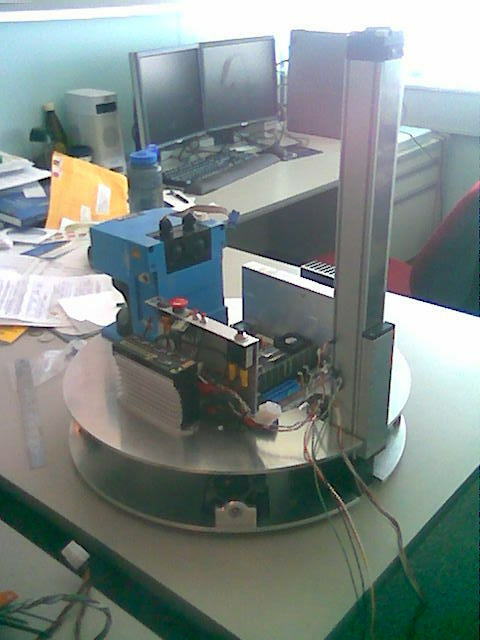 Drive mechanism redesigned to meet previous month testing: gear boxes added, some mechanical mounting methods changed. 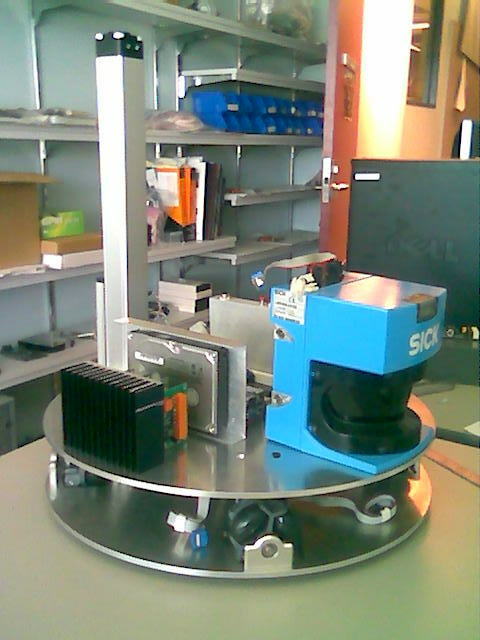 New Maxon motors, encoders and gearboxes for the new design arrive early October 2006. New mechanical design should arrive January 2007. Before the design of the InsectBot, there was the Burpbot, which was founded and lead by Dr. David Austin and Dr. Nick Barnes. It was developmented under the "Ubiquitous Robot Project Proposal". More information about the Burpbot (e.g. history) can be found here.